Happy New Year from all of us here at Ballyknocken House & Cookery School and I hope you enjoyed a fantastic Christmas and a well deserved break. I am excited for the year ahead and all the plans we are ‘cooking up’……. pardon the pun !. The Cookery School opens its doors again on the 16th of Jan with Super Foods for Super People. I am sure that one will be a hit considering its the right time for a new year and new you. It really is a great class as our budding chefs learn all about how to use these power packed super ingredients in everyday cooking for all the family. We are going Italian then on Sunday the 17th with our always popular Southern Italian class, with such Italian gems like Caponata, Fresh Pasta and Open Ravioli with wild Mushroom & Chicken Sauce, Polpette de Melanzane, Char Grilled Squid and our delicious Amaretto Truffle Torte to name but a few. This class comes complete with tasting plate/ light lunch. If you would like a full list of all our classes you can find them here on our cookery calendar. In the spirit of Super Foods, I am including this week a recipe for a gorgeous salad that is so feel good it’s amazing ! A warm “feel good “ salad that is so simple to prepare. 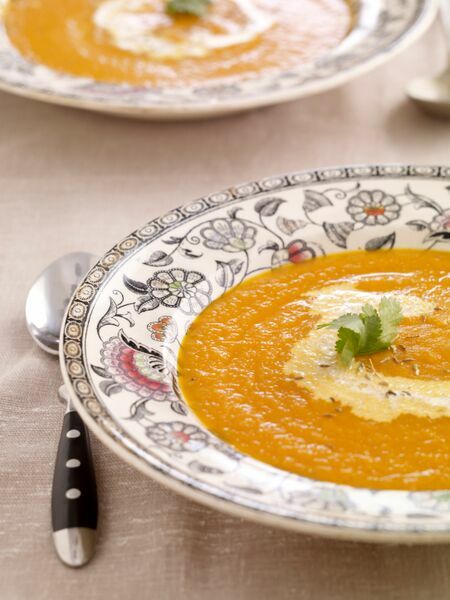 The butternut squash is a good source of Vitamin A as well as fibre and potassium. By adding the orange zest to the dressing one does not need any salt. Preheat the oven to 180°C / Fan 160°C / Gas 4. Sprinkle the cumin and honey over the butternut squash and roast for about 30 minutes until lightly golden and cooked. Add the apple wedges about 10 minutes before the end of the roasting time. Heat a frying pan with a little oil, sauté the red cabbage. To make the dressing, combine the orange juice, vinegar and olive oil in a small bowl. Place the roasted butternut squash, and red cabbage in a large bowl, drizzle with some of the dressing. Spoon on a serving platter, arrange the apple wedges, drizzle over a little more dressing. Sprinkle over the hazelnuts and the basil leaves. Tip: Try adding crispy pancetta or even pumpkin seeds. Hi everyone and I hope you are all set now on the home stretch before the festive holidays. We have had a such a fantastic last week here at Ballyknocken House & Cookery School . Our 12 days of Christmas recipes are still going out every day in the lead up to the main event and are packed full of great recipes gadget ideas and top tips such as edible gift ideas, turkey roasting tips and how to spice up those sprouts. The phone has been buzzing with all our lovely customers picking up Ballyknocken Christmas Vouchers thank you so much for choosing Ballyknocken for the special gift for your loved ones. You can still pick up a last minute voucher here or call the office on 0404 44627 and Sharon will take care of you. This week I would like to share this idea for edible gifts that really shows thought and they are loved by all. They can be put in a lovely jar and look really fab under the tree. Tip : Edible gifts show you’ve taken the time and effort to make them for the lucky recipient! It can be a great way of spending time with the kids at this busy time of year. We know they’re popular because our edible gift class always sells out! Preheat the oven to 180C / Gas 4. In a large bowl, beat the egg whites until stiff. Gently mix in the sugar, amaretto and almonds.Place some baking parchment on a baking tray and butter lightly. Using a teaspoon place small dollops (about 2cm) onto the sheet. Bake for 12–15 minutes until a pale golden brown. Leave to set on the baking tray, as they are quite soft at this stage. The will harden as they cool. Tip: Add 2 tbsp of dried cranberries to the mixture. Less is more – alternate your alcoholic drinks so you’re not over-doing it. They can be used straight from the freezer over lasagne or for a crispy topping for any vegetable bake. I usually flavour them up with herbs, grated cheese and even spices such as paprika. Preheat the oven to 180°C/fan 160°C/gas 4. Line a roasting tray with parchment. Combine the ricotta and spinach with a little salt and pepper. Slice a “pocket” into the breast of the chicken and spoon in the stuffing. Combine all the ingredients for the topping and mix well. Move the supreme of chicken onto the roasting tray and generously sprinkle over the seasoned breadcrumbs, carefully patting down and drizzle over some rapeseed oil. Roast for about 25 minutes depending on the size of the supreme of chicken. Check that the chicken is cooked, the juices should run clear. In the meantime, cook the orecchiette or pasta of your choice according to the packet’s instructions. Drain and keep warm. To make the sauce, heat a medium saucepan with oil, add the leeks and sauté until softened but not brown. This will take about 5 minutes. Add the garlic and cook for about 1 minute. Stir in the crème fraiche, vegetable stock and cream and simmer for 1 minute. Add the lemon zest and grated parmesan. Check the seasoning adding more parmesan to taste. Combine the pasta with the sauce and serve with the chicken. Garnish with sprigs of dill and serve immediately. Tip: if you prefer to fully coat the chicken in breadcrumbs, then flour the chicken, dip in beaten egg to milk and then into breadcrumbs. This method works very well for frying of deep frying the breaded chicken. I process all stale or leftover bread into breadcrumbs, spoon them into a sealed bag and freeze – it’s the easiest and simplest trick of all! Herby Crumbs – again this may seem obvious but why not add herbs to your breadcrumbs before you freeze them. Simply choose your herb seasoning, I like Italian, and a sprinkle of sea-salt and you have the perfect crunchy topping for your next lasagne or pasta bake. French Toast, in fact it is recommended to use bread that is a few days old for best results. It’s original name “pain perdu” means lost bread! Whisk together egg and milk and sprinkle of sugar and cinnamon in a shallow bowl and dip the bread in to soak up the mixture before frying in pan with a little butter till golden on both sides. Serve with fruit for a perfect after-school snack or weekend brunch. Summer Pudding – a traditional summer pudding can be made all year round. Just line your pudding bowl with stale bread fill with fruit cover the top with a last slice of bread and cling-film overnight in the fridge. Serve with crème fraiche. This could be a light alternative to Christmas pudding too! Add breadcrumbs to meatballs and home-made burgers and for a softer lighter texture soak your breadcrumbs in milk first for the best results. To use up stale Brown Bread why not try a Brown Bread Ice Cream for something a little different. For a through back to the 80s try making Melba Toast, a thin dry toast which makes a delicious base for canapes. Again stale bread is recommended for this, simply dry out in oven and your toasts can be kept in air tight container for up to a week before using. Divine with hummus, pate or simply spread with cream cheese. An all-time favourite growing up was Bread and Butter pudding another great way to use up stale bread. This is delicious at Christmas with Cranberries and mixed spice for a seasonal twist. And finally I leave you with something Italian which I feature in my first cookbook, Panzanella, an Italian Bread Salad where the bread and good quality ripe tomatoes are the star ingredients. You can also use whatever veg is left in the fridge from peppers to red onion and cucumber. The more colour the better drizzle in light vinaigrette and let sit for at about 30 minutes to let flavours infuse. Great for using up the end of sourdough or other artisan bread. Preheat the oven to 180°C/fan 160°C/gas 4. Toss the beef in the seasoned flour in a Ziploc bag and shake the beef until coated. Remove the beef from the bag and shake off the excess flour. Heat some oil in a casserole over a medium heat and add the beef in batches. Brown well on both sides and set aside. Add a little more oil to the casserole. Reduce the heat to low, add the onions and sauté for 8–10 minutes, until the onions are soft. Add the garlic and cook for a further 2 minutes. Add the diced butternut squash, peppers, thyme, stock, tomato purée and balsamic vinegar and return the beef to the casserole. Cook in the oven for 1 1⁄2 hours or until the beef is tender, stirring occasionally. Check for seasoning, adding salt and pepper as required, and serve. Hi everyone, well it is coming into that time of year again and I am excited to be taking to the road around the country for my many festive Cookery Demonstrations. This week I enjoyed a fantastic Christmas themed demo in Joyces Wexford for Whirlpool Ireland. I use all Whirlpool state of the art ovens in the cookery school, and they really are amazing. Here is my upcoming schedule for cooking demonstrations and events and I really would love you pop along and chat to me if they are local to you. In conjunction with European Week for Waste Reduction Catherine Fulvio is working hard with Laois and Westmeath County Council to create awareness around this important topic. 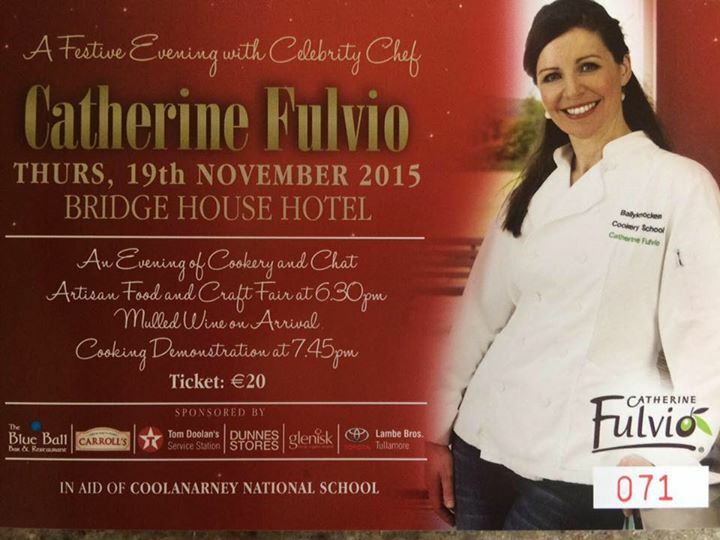 Catherine is an advocate of the Stop Food Waste programme in Ireland and will host two Cookery Demonstrations as follows: The Killeshin Hotel, Dublin Road, Portlaoise on Wednesday 25th November and in the Radisson Blu Hotel in Athlone on Thursday 26th November at 7pm sharp. So they are the events and other happenings from me and Ballyknocken Cookery School, don’t forget we still have some spaces left on our Cracking Christmas and Head Chef Junior Chef classes this coming December so visit the site to see all the details. I leave you with this simple healty recipe for your Sunday Roast and will check in with you all again next week. Grease frying pan use either butter or reduced fat sprays. Brown chicken on both sides. Remove chicken and place in casserole pan. Add garlic to frying pan and cook until you smell garlic then remove to casserole pan. Add wine to deglaze the pan and add to casserole pan. Slice lemon and top each piece of chicken with a slice of lemon and rosemary. Hi everyone, this week I would like to share one of my favourite soup recipes for these Autumn evenings when it’s getting chilly. After a busy day in the Cookery School, there is nothing nicer than a hot steaming bowl of soup and some fresh baked bread from the oven. I hope you all have a lovely Halloween and it won’t be long before we all start planning for Christmas and this week we are all so excited here in Ballyknocken as we launched our brand new website, we would really love to hear how you are finding it, we hope that is is easy to navigate and you can book everything online now including those all important Christmas Gift Vouchers with ease and comfort. Melt the butter in a saucepan and add the chopped vegetables, cumin, salt, pepper and sugar. Cover with parchment paper to retain the steam and cover with saucepan lid. Leave to simmer for approximately 10 minutes. Remove lid, add the stock and simmer until the vegetables are soft. Add the lentils and simmer for a further 6 minutes. Place the vegetables and liquid in a food processor and puree / blend until smooth. Check for seasoning and stir in the milk. Garnish with a swirl of cream and serve immediately.